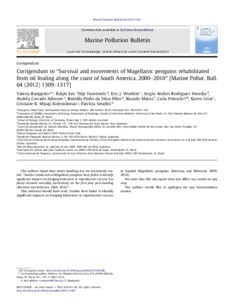 The authors regret that under heading 4.4, we incorrectly stated, "Studies conducted on Magellanic penguins have failed to identify significant impacts on foraging behaviour or reproductive success, but found elevated mortality particularly on the first-year post-banding (Boersma and Rebstock, 2009, 2010)". This sentence should have read: Studies have failed to identify significant impacts on foraging behaviour or reproductive success in banded Magellanic penguins (Boersma and Rebstock, 2009, 2010). We note that this mis-quote does not affect our results in any way.